Immediately at the start of commercial, a small percentage of the audience tunes away. The audience starts to grow again about halfway through the break, presumably as some of these viewers return in anticipation of the programming resuming. Once the programming resumes, the audience builds back up to roughly its original size, over the course of about two minutes. 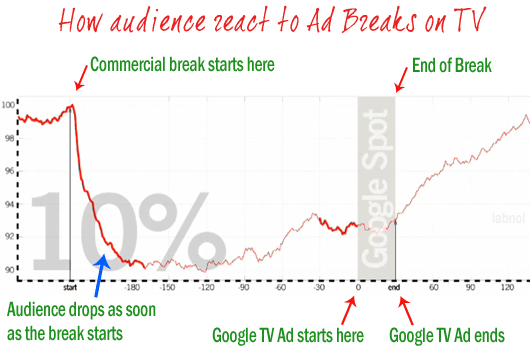 Simply put... Ads placed at the media spots at the starting of the commercial break or just before the end of the break (i.e. the 1st and the last ad) have a better viewership. Moreover I prefer the last media spot (as compared to the other spot inspite of having a lower viewership at that point) as the audiance would be less prone to change the channel in the apprehension of the current program resuming. Also the last portion of the ad which usually contains the brand name and the tagline has more chances of being viewed and hence remembered. I agree with with you VJ1681, the Ads place 1st and last are more seen. This is perfect example to analyse the 5Ms of Advertising. Mission - Money - Message - Media - Measurement. A perfectly planned ad with the 5Ms in consideration will always have the target viewers looking at the ad. For Example: The new Vodaphone Zoozoo ad, has hit the target.This is because every time there is suspence and the audience is tempted because of that. So, no matter how many viewers view a ad, the successful ones will be the ones that draws audience attention only when you are able to penetrate audience heart with a mix bag of suspense to follow up.